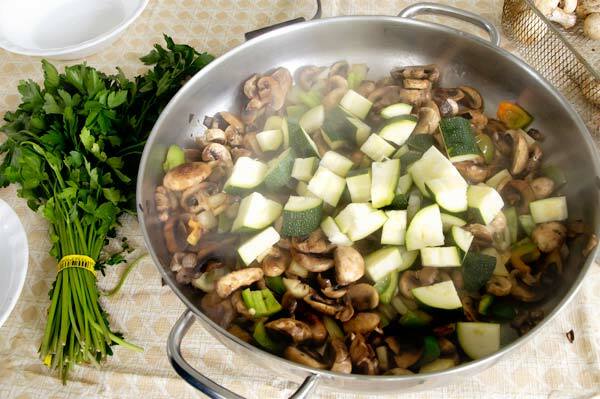 On hot summer days when you don’t feel much like cooking, a quick vegetable stir-fry can get you in and out of the kitchen in a hurry. The food’s fresh, filling, and not too heavy. I particularly like this recipe for front porch cooking on days when I don’t want to heat up the kitchen. It’s adaptable for meat-lovers who can’t imagine a meal without beef, chicken, pork or whatever wild game is the favorite of the moment. 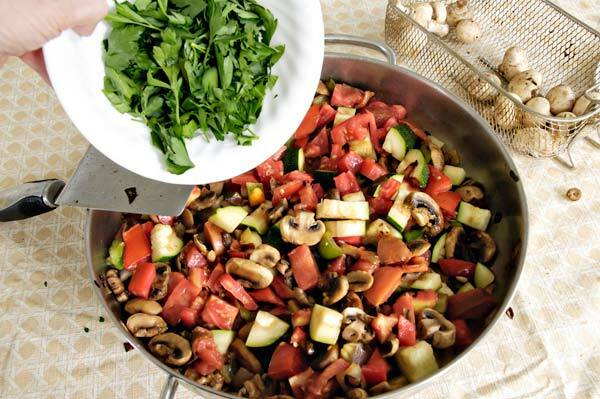 You can substitute some of the vegetables, too, or vary the proportions depending on what’s available and what your family likes and dislikes. 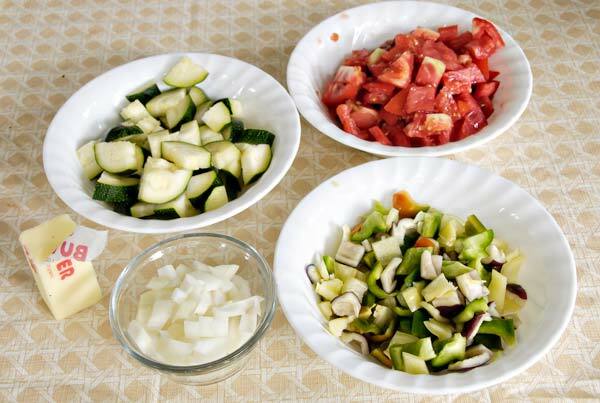 Start by assembling your ingredients. Get the chopping, the slicing, and the dicing out of the way before you turn on the skillet. For this batch, I started with a medium zucchini, half a yellow onion, and several small bell peppers of various colors from the farmer’s market. I added two vine ripened heirloom tomatoes from a neighbor — a medium-sized Gail’s Cross and a large, meaty Bear Creek, which is a recently developed cross of Cherokee Purple and Brandywine, my two favorites. (I’ll write more about that glorious creation another time.) Not shown are the pound of freshly washed mushrooms and parsley from the organic foods co-op I belong to. I start by melting a half stick of butter on medium heat. Olive oil, canola oil, plain vegetable oil, or even lard will work just as well, and each lends a subtly different flavor. Use what suits your tastes, mood, or cholesterol level – add a little or add a lot, just make sure you use enough to prevent sticking. Add the onions and cook at least until they’re tender and starting to turn translucent. I’m particularly fond of caramelized onions, so I let my onions cook until they’re soft and browning nicely before I add any other vegetables to the skillet. While the onions finish, I trim and slice the mushrooms. 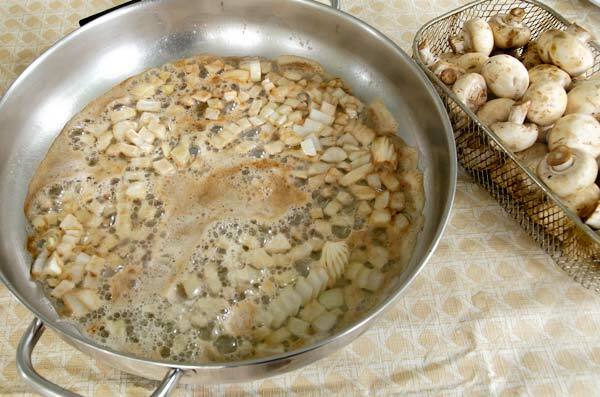 Once the onions are done, I toss in the mushrooms and mix them well. Occasionally it’s necessary to add a bit more butter or oil at this stage to keep the mushrooms from sticking. 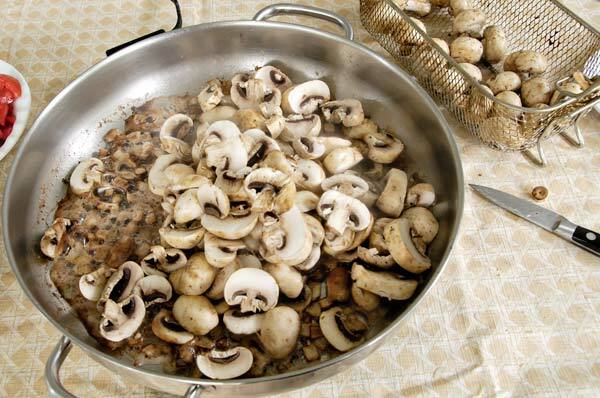 I like to let the mushrooms cook for 2-3 minutes, stirring about every 30 seconds to keep them cooking somewhat evenly. Add the chopped peppers . . .
. . . and the zucchini . . .
. . . and the diced tomatoes. Mix well. At this point, I usually assess the colors and proportions and decide whether I’m happy with the mix. Most of the time it’s good, but occasionally I’ll grab another tomato and quickly cut it into chunks and add it. 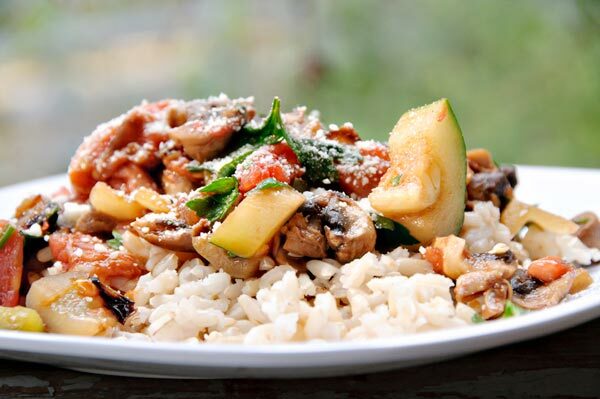 I tend to keep extra mushrooms close, too, because that’s the ingredient I’m most likely to want to increase. When I’m satisfied with the balance of ingredients, I quickly snip the parsley into bits with the kitchen shears and drop it in. You can use cilantro if you prefer, salt and pepper to taste, or add some red pepper to spice it up. Cook until the zucchini is hot, but still firm. Serve over hot rice or noodles, and sprinkle generously with grated Parmesan cheese. Melt butter in skillet over medium heat. Add onion and cook until tender and beginning to brown. 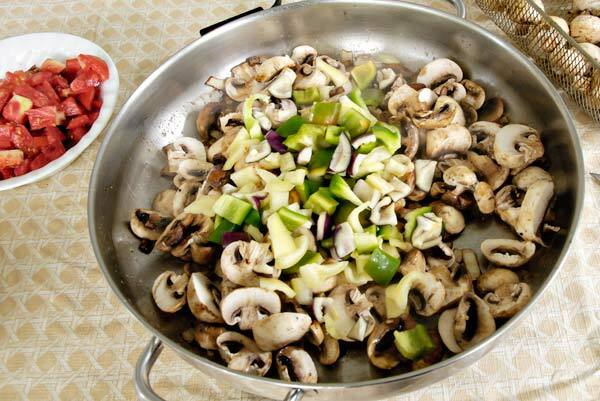 Add mushrooms, and cook for 2-3 minutes, stirring every 30 seconds. Add peppers, zucchini, and tomatoes. Mix well. Add parsley. 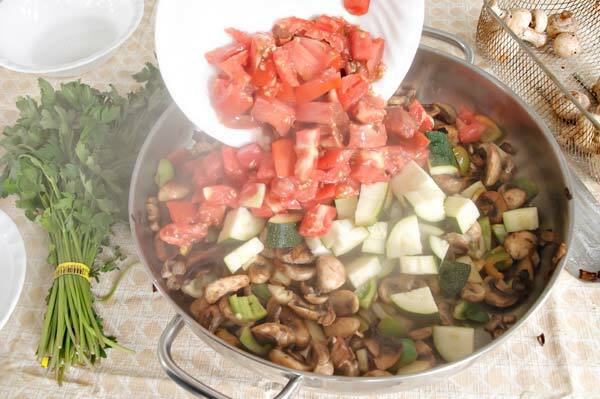 Cook a few minutes until vegetables are tender but not overcooked. Remove from heat. Serve over hot rice or noodles.